Right off the bat I can tell you this isn’t the stuff your grandmother used to eat. 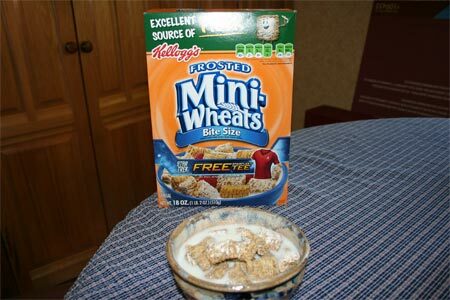 Kellogg’s must have realized somewhere along the way that Americans would prefer to start their mornings with manageably sized, sugary abominations rather than giant bricks of shredded wheat. I understand, I get that. What I don’t understand is why they have to put a cartoony mini-wheat in the upper right hand corner of the box! (*side note: I don’t know what the little dude is holding, but it kind of looks like a joint. Maybe the real reason he’s grinning?) I don’t want to look at cartoons and feel like 6 year old when I’m eating this stuff! If anything, it just shames me into realizing that, much like a 6 year old, I will pretty much eat anything that has ‘Frosted’ in the title. Embarrassment was short lived, after I realized that this box of cereal was my key to receiving my very own STAR TREK STARFLEET TEE! Before I get into the cereal itself, one quick mention of the coolest thing about this product. If you look on the Nutrition Facts on the side of the box, it actually lists the serving size as About 24 Biscuits! Biscuits! I didn’t notice this until after I’d finished the bowl, and it got me thinking. You never go to IHOP and order biscuits and milk! I totally ate these the wrong way! In the future, I’m going to do right by the Bite Size Frosted Mini-Biscuits and enjoy them like mashed potatoes. With gravy, that is. Despite all these preconceived notions I had about the cereal from the box, I enthusiastically took my first bite. I was immediately underwhelmed by the amount of frosting on my first bite. The sugar:wheat ratio was disappointingly low. The pictures on the front totally misrepresented the cereal inside. I was expecting each biscuit to be garnished with a sweater of frosting. This simply wasn’t the case. The texture was solidly crispy, almost like biting through an unsaltly stack of potato chips. That was a good thing though, since I enjoy feeling my daily dose dietary fiber as I chew it. Overall, I was pretty lukewarm on the experience. It isn’t a cereal I’d necessarily pass up on if I found it in my cabinet, but I wouldn’t go out of my way to buy it at the grocery store.